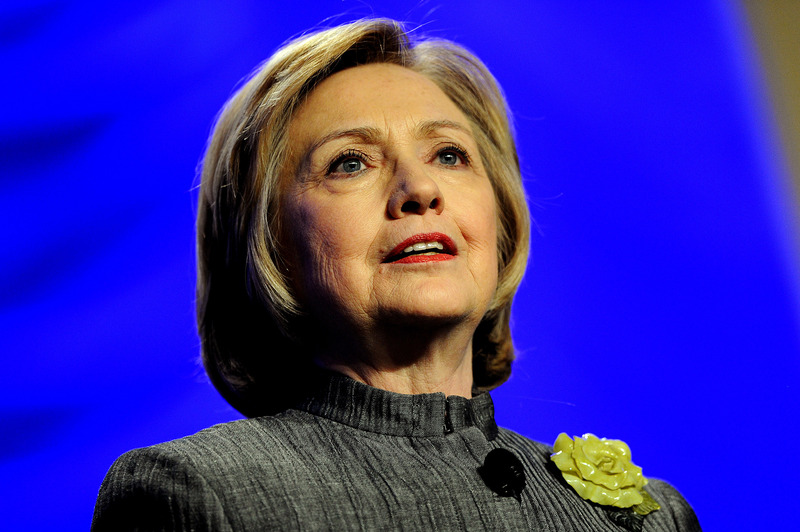 Over the past several days, you've probably heard a lot about Hillary Rodham Clinton. Specifically, on the controversy and criticism she's absorbed over her use of a personal email account while serving as Secretary of State. It's an unhappy chapter for her, with her widely anticipated presidential campaign not even underway yet, but it's also having the effect of overshadowing some of her distinctly good, vital work as a private citizen — namely, on behalf of gender equality worldwide. Basically, don't forget about Hillary's No Ceilings report, which was released in concert with her appearance for the Clinton Foundation on Monday. It's important because even if you're upset about her online communication practices, it gives meaningful insight into how women are faring across the world. Hillary (as well as her daughter, Chelsea, and husband, Bill, of course) has devoted a lot of her time to this cause, on behalf of the Clinton Foundation, and regardless of how you feel about her politics, they're deeply important issues — not just to the women of the world, but the men, too. Equality, simply put, is better for everyone. Here are some of the headline takeaways from the No Ceilings report. Few things are as immediately revulsion-inspiring as the idea of child marriage. And, sad to say, it's still a widespread and pervasive problem across the world. In 2010, according to the report, some 67 million women around the world had entered into marriages while under the age of 18, and nearly one-third of all the world's nations legally permit girls to be married at younger ages than their male counterparts, provided they get parental permission. This seems, frankly, as representative of a toxic, patriarchal system as it gets — prioritizing male desire over female agency. Make no mistake, while the report acknowledges the practice has been in a slow decline, this needs to change sooner rather than later. In spite of the fact that freshly drafted constitutions have, by and large, contained more gender-based protections than the historical trend (95 percent since 1995, as opposed to just 73 percent in years prior), women around the world are both still subject to onerous legal restrictions, and often don't have all the rights in practice that they do in theory. For example, over 150 countries lack the legal framework to give women a fair economic playing field — "including access to capital, property ownership, and caregiving leave," according to the report. There's a domestic connection on this one, to boot. Although it might not be as severe as in some places, you need look no further than the plight of American women across the country to find constitutionally mandated rights that are tenuous in practice — that's right, I'm talking about abortion. Despite access to reproductive health services being ruled constitutional under the Supreme Court's Roe v. Wade decision of 1973, Republican-led state governments have been trying to strip that right by virtually any means necessary, using targeted regulations to force clinic closures over broad swaths of the country. It's a lot less likely to be on top of the heap when you're a woman, that much remains clear. According to the report, while the percentage of women in global national legislatures has improved significantly since 1997, from just 12 percent to 22 percent, true gender parity is still a long way off. Nor is it much better in the private sector, with just 5 percent of Fortune 500 CEOs being women. Something else of considerable importance that Hillary mentioned in her appearance Monday (naturally, being a former Secretary of State) is the dismal number of women in the loop on peace negotiations, under 10 percent worldwide. Suffice to say, the world of international diplomacy is still startlingly a boy's club. Laws in all countries but the Marshall Islands, Micronesia, Nauru, Niue, Palau, Papua New Guinea, Suriname, Tonga, and the United States provide for paid leave for mothers of infants. Yup, you read that right. Just nine countries without maternal leave laws on the books! Unfortunately, sticking out like a sore thumb is the last nation on that list, the United States. If it seems woeful and shameful, well, it is — I'm not sure how many comparative lists the U.S. would end up on alongside the tiny island nation of Nauru, one of the tiniest countries in the world, but failing to provide new mothers with paid leave is one example. It's also worth noting that, if a country wants to help women post-childbirth, they should be giving paid paternity leave, not just maternity leave. Implicit in maternity leave is the notion that a woman must reasonably be the parent who stays at home to raise a child, ostensibly leaving a male parent to continue working to provide financial support. But that's little more than a gendered stereotype — men can care for children too, and the ability of both parents to spend time with their kids in their early lives can be enriching and liberating for all involved.